The environment of a university – what we term a campus – is a place with special resonance. They have long been the setting for some of history’s most exciting experiments in the design of the built environment. Christopher Wren at Cambridge, Le Corbusier at Harvard, and Norman Foster at the Free University Berlin: the calibre of practitioners who have shaped the physical realm of academia is superlative. Pioneering architecture and innovative planning make for vivid assertions of academic excellence, while the physical estate of a university can shape the learning experiences and lasting outlook of its community of students, faculty and staff. However, the mounting list of pressures – economic, social, pedagogical, technological – currently facing higher education institutions is rendering it increasingly challenging to perpetuate the rich legacy of campus design. In this strained context, it is more important than ever that effective use is made of these environments and that future development is guided in a manner that will answer to posterity. 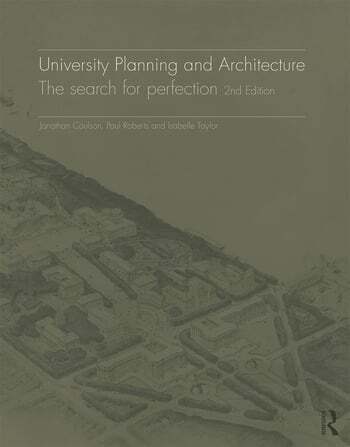 This book is the definitive compendium of the prestigious sphere of campus design, envisaged as a tool to help institutional leaders and designers to engage their campus’s full potential by revealing the narratives of the world’s most successful, time-honoured and memorable university estates. It charts the worldwide evolution of university design from the Middle Ages to the present day, uncovering the key episodes and themes that have conditioned the field, and through a series of case studies profiles universally-acclaimed campuses that, through their planning, architecture and landscaping, have made original, influential and striking contributions to the field. By understanding this history, present and future generations can distil important lessons for the future. The second edition includes revised text, many new images, and new case studies of the Central University of Venezuela and Indian Institute of Management Ahmedabad. Jonathan Coulson and Paul Roberts are Directors of Turnberry Consulting, a development strategy consultancy created to help landowners to develop real estate projects driven by quality and functionality. They have extensive experience working within the university sector, preparing and delivering development proposals and master-planning initiatives. Isabelle Taylor read history of art at the University of Cambridge and Courtauld Institute of Art. The three have also jointly authored University Trends: Contemporary Campus Design (2014), a survey of the trends currently shaping the fields of planning and architecture in higher education.